Dies R Us: A Day at The Beach! Can you believe it is already May? And almost time for trips to the beach! I couldn't pass up this adorable image from Tiddly Inks. She is obviously ready for a fun day in the sun! I had the perfect dies for her: Cheery Lynn Dutch Scallop Square, Spellbinders Oval Regalia, Impression Obsession Beach Chairs & Impression Obsession Sailboat. I have a tip you may like for cutting your dies. I cut them in white cardstock and then color them with my markers so they match whatever I am coloring. It's so much easier than trying to find the perfect color match with your paper stash! 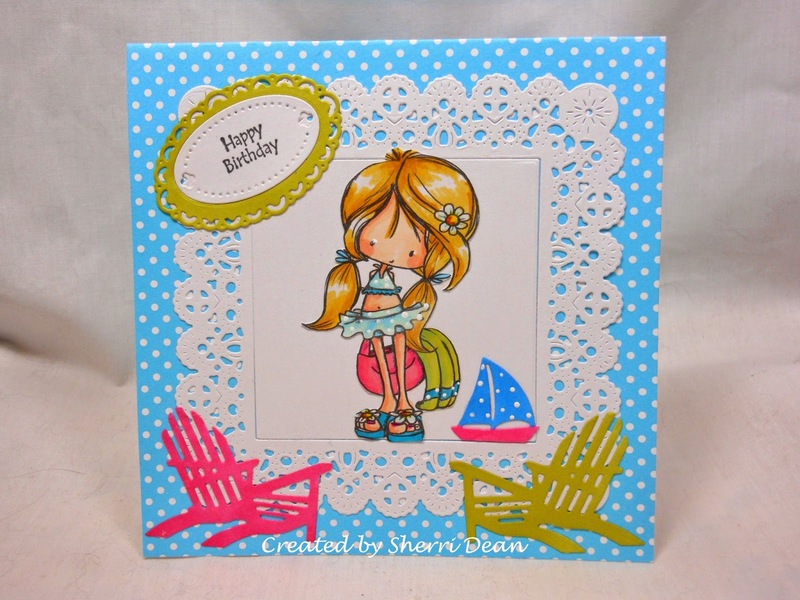 Be sure you all visit the Dies R Us Challenge Blog! We are having a month long celebration of our one year anniversary with lots of chances to win gift cards! Until next week, have a wonderful week & create something wonderful! Super cute Sherri...makes me want to go to the beach and of course makes me want more dies, too...sigh! !